Seven Stars Self-Catering01597 829174work Self-cateringA converted 1700's oak framed barn with Spa hot tub. Modern open plan style on the inside,traditionally timber-clad on the outside. Enclosed outdoor area with Spa hot tub which is fun to share or soak away cares and a garden table for " al fresco" dining. All under big skies, between a mighty ridge and the rolling valley. Enjoying a charming rural setting with easy access to the A44 at the very heart of Wales, our Holiday Lodge makes an excellent centre for car tours, off roading, biking, hiking or just chillaxing!. 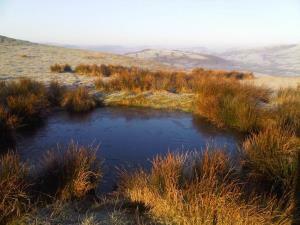 The Elan and Upper Wye Valleys are close by -great for walking, fishing or Red Kite watching. A converted 1700's oak framed barn with Spa hot tub. Modern open plan style on the inside,traditionally timber-clad on the outside. Enclosed outdoor area with Spa hot tub which is fun to share or soak away cares and a garden table for " al fresco" dining. All under big skies, between a mighty ridge and the rolling valley. Rhayader and Llandrindod Well's shops, inns, livestock markets, spectacular Red Kite feeding station, Welsh crystal factory, cycle hire, indoor swimming, play barn and park are just 5 miles away. The museums, galleries of the Welsh Marchers including Ludlow’s renowned cuisine and Hereford Cathedral are an easy drive. Fishing on the Wye or Llyn Gwyn (1 mile) are close by; the Cardigan Bay dolphins and beaches within an hour. Dining pub 2 miles. From the A44 between the village of Crossgates (west) or Rhayader (east), turn into the village signposted Nantmel. Follow the village road until you see a white victorian house - 'The Seven Stars', next to which is the 'Barn House'. Open the gate and drive into the yard and park in spaces marked visitor.